Jeff and Sam made Kimchi for the farm, I can’t wait to try it! Do you have several napa cabbage and other random CSA veggies hanging out in the bottomo of your fridge? Here is one way to preserve them and enjoy a spicy, sour, crunchy treat that is rich in probiotics. Jeff, a CSA work-trade member of the farm, shared this recipe with us. He ferments about half of his weekly share to keep up with the harvest and preserve some of these goodies for later. You’ll need a scale for this recipe, it is important to weigh out the cabbage and salt. You’ll also need clean jars and lids (re-used pickle jars or wide mouth canning jars are fine), and some very large pots or bowls to mix everything. Make sure to have very clean hands, too. Mix salt with the cabbage and let wilt for a few hours, while chopping the other vegetables and making the pepper sauce. This will make it easier to pack into the jars. 3 ½ lbs (or more) chopped carrots, daikon radishes, onions, leeks, sunchokes, etc. Add the other chopped vegetables to the wilted cabbage, and mix in pepper sauce (recipe below). For a less spicy version, try adding only ginger and garlic. You could add paprika for the red color but no spice. 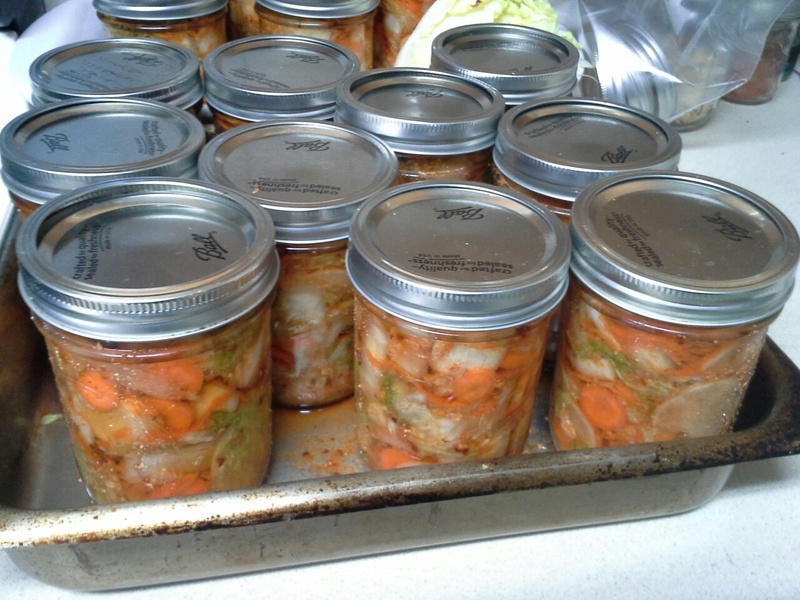 Mix all ingredients together and pack into jars, leaving space at the top for the Kim Chi to expand as it ferments. Lid the jars, leaving enough looseness for the carbon dioxide to escape as it ferments. Set in a bowl or deep pan to catch any juices that escape, and let ferment for 3-7 days, to taste. Check jars and keep the top of the kimchi submerged in brine by pressing down with a clean utensil or the bottom of a small jar. You can also place a cabbage leaf on top if you like while it’s fermenting. When it is finished, tighten lid and refrigerate.